This post takes a high-altitude look at biology, with respect to principles which govern biological organization and origins. Some such principles have often been referred to as ‘laws’, but how much can be generalized? Usually the word ‘universality’ is stated with reference to life on Earth, but here the intention is to examine how much it might be possible to claim, with any measure of confidence, that certain principles should be universal in an absolute sense – for life as it might occur anywhere in the universe itself. Even the most casual student of the sciences will be familiar with the concept that physical laws govern how things work, how the universe operates. Consider, for example, the law of gravitation, or the laws of thermodynamics. These have all been derived from empirical observations that ultimately have enabled the formulation of regular mathematical relationships (equations) between key fundamental physical factors that contribute to the observed phenomena. (For example, in the case of gravitation, distance and mass are identifiable as such factors). To qualify as a ‘law’, such a derived relationship should apply universally (literally, anywhere in the universe), and enable predictions to be made, based on inputting specific values into the mathematical terms of interest. At the same time, as formulated by humans, a physical law may not necessarily be an immutable entity, since further information may reveal specialized circumstances where its predictive utility or true universality breaks down. This of course, has been the experience with the transition from Newtonian to relativistic Einsteinian physics. The latter advance of the early 20th century has been well-validated as a better fit to the universe than its older predecessor, but Newton’s achievements worked very well and very accurately in describing both local and astronomically observable phenomena for centuries. As indeed they still work today, on an ordinary scale familiar for most human activities. Laws are thus derived from basic observations and experimental testing, and could be viewed as a high-level procedure for organizing and making sense of empirical data, and seeking generalizations. Indeed, the process of ‘law-making’ itself may be reducible to definable pathways, as recently shown by the application of algorithms for deriving ‘free-form’ natural laws when experimental input data is provided. Mathematics is thus an intrinsic and ineluctable part of a formulated physical law, and in great many cases, the agreement between solved mathematical equations for specific laws and observed physical events is profoundly accurate. Why there should be this ‘unreasonable’ correspondence between mathematical constructs and reality has long been a topic for speculation among both physicists and philosophers. Physical laws are in the most general sense the domain of the science of physics, but they do not end there, at least in their specific applicability. Thus while chemistry ultimately is a manifestation of physics in terms of the electronic properties of matter, the behavior of matter is subject to many laws defining chemical reactivity. Thus, chemicals combined under the right conditions (solvents, concentrations, temperature, pressure, and catalysts if necessary) will react in highly predictable manners. And this too is expected to be the case anywhere in the universe, provided the starting conditions are the same. Chemistry is to physics as biology is to chemistry. If biology is a very special manifestation of chemistry, just as chemistry is a particular outcome of the laws of physics, then should there not be a set of fixed biological laws as well? Should not the mathematical precision of the physico-chemical sciences be applicable in all areas of biology as well? Yet unlike the simpler foundations of chemistry, biology has some peculiar aspects which can make formulation of truly universal laws much more problematic. The first issue might be called a ‘sample size’ problem, in that all life on Earth has a fundamentally common molecular basis, rendering universal conclusions drawn on such a single-precedent accordingly more difficult ‘Life 1.0’ (This general topic has been touched upon in some previous posts, including 21 March 2011 and 28 June 2011). A second related problem even within the set of all life on Earth is dissecting ‘chance and necessity’ in evolutionary trajectories. Even where certain biological features are universal on Earth, that may not necessarily imply that no other possible solutions exist towards the most fundamental biosystem requirements, even using the same basic informational and functional molecules of life. The most fundamental features of cellular life, including nucleic acid replication mechanisms and ribosomal protein synthesis, may become fixed at an early stage of molecular evolution and preclude their replacement by even potentially superior alternatives. (This is the ‘frozen accident’ scenario also referred to in previous posts). Nevertheless, just as the laws of physics apply everywhere in the universe, a ‘real’ biological law should be applicable to all conceivable forms of life. But since no other ‘life sample’ is currently available, this kind of demand is difficult to fulfill with confidence. In part owing to these kinds of constraints, less restrictive definitions of biological laws have been acknowledged as having a certain practicality. These ‘lesser laws’ might also be referred to as ‘rules’ or ‘patterns’ if desired. 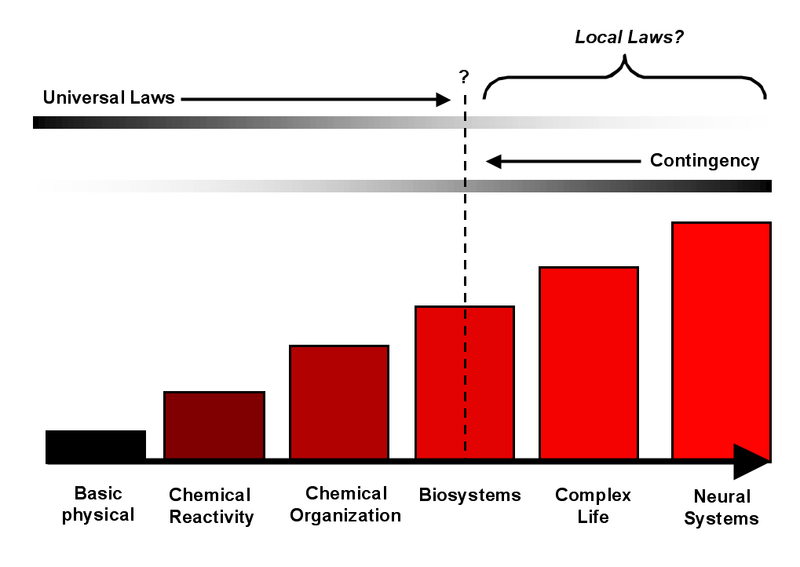 But for the purposes of this post, I will use the categories of local vs. universal laws, where a ‘local’ law is strictly applicable only to the biological context of life on this planet ‘as we now it’, and a ‘universal’ law is just as it implies – applicable to any biosystem bound by the higher laws of chemistry and physics. Of course, making such a theoretical distinction in itself is easy; deciding on what should specifically be placed in either category is another matter entirely. And in the absence of at least one other life sample, it could be contended that it is impossible to establish such a dichotomy with complete surety. Yet it is certainly possible to appeal to logical argument, and proceed accordingly. (1) The eponymously named Hodgkin-Huxley model of neurotransmission formulated in the early 1950s provided a very good mathematical accounting for the behavior of neural ‘action potential’ signaling, even before the discovery of protein-based membrane ion channels. Although an impressive achievement, the Hodgkin-Huxley model does not account for certain thermodynamic features of nerve transmission, and has been challenged by other approaches, notably the soliton model. (2) Sleep, or at least periods of dormancy with sleep-like characteristics, is very widespread, if not universal, in animals with even simple nervous systems. Allied to this is the ubiquitous existence of neurally-controlled circadian rhythms. It is has been suggested that the phenomenon of sleep might ultimately derive from the inherent properties or intrinsic demands of neural networks. Despite much investigation, the functions for sleep are still enigmatic. But even aside from this difficulty. it is clear that there is a wide range in both the quantity and qualitative nature of sleep periods required even within mammals. (But more will be said in later posts on circadian rhythms as a subset of biological oscillations). (3) Anesthesia can be induced in animal nervous systems with a disparate array of substances, even including inert gases. A long-standing correlate of anesthetic potency is found with the Meyer-Overton rule, which predicts membrane permeabilities from a compound’s partitioning coefficient between oil and water phases, in turn reflecting the molecule’s degree of hydrophobicity. It has been observed that the Meyer-Overton rule provides a remarkable linear correlation between partitioning coefficients (irrespective of molecular structures) and minimal concentrations of molecules required for observable anesthetic activity. The range where the correlation seems to hold (over six orders of magnitude) is probably unprecedented in biology. The keyword ‘rule’ for the Meyer-Overton correlation (as opposed to ‘law’) should be noted in particular. This is the case since there is still no convincing mechanism by which the differential membrane permeability of diverse compounds would affect their anesthetic properties. In addition, given the molecular diversity it covers, it has been assumed that the Meyer-Overton rule relates to anesthesia as a single phenomenon, but it seems more likely that a group of related pain and consciousness-ablating effects are involved. Apart these inherent limitations, all of these three examples are premised on the basic structure of neural axons, membranes, and ion channels. Yet it is not at all clear that neurobiology must necessarily be arranged as it is, that alternative structural patterns would not be possible. Even more fundamentally, it cannot be claimed with any certainty that neural signaling is the only possible pathway for a biological realization of the kinds of activities permitted by neurobiology in Life 1.0. All of these considerations point to the above examples as being at best specifying laws of local applicability, to varying degrees. Another general example highlighting ‘locality’ in this context is found within Mendelian laws of heredity, upon which the concept of genes and genetics is founded. At first glance, these might appear to have much better prospects as true Laws, since genetics is globally applicable, encompassing organisms totally lacking neural systems. Yet notwithstanding the importance and utility of Mendelian genetics, here again any case for universality runs aground on variation even within terrestrial life. Beneath the initial relative simplicity, many and varied instances of non-Mendelian inheritance and genetics are known, and the definition itself of a ‘gene’ has becoming correspondingly difficult. All of this emerges before it is even necessary to speculate on entirely distinct biological information transmission systems. By now, it should be apparent that searching for deep and truly universal biological laws has much overlap with attempts to define life itself. So with that in mind, where does that lead us? Consider a rapidly free-swimming macroscopic organism existing in a liquid medium anywhere in the universe. (It would be unlikely that such a medium would be anything other than water, but in principle other fluids could apply). It would seem entirely logical to suggest that, regardless of the underlying molecular constitution of the organism’s biology, or its higher-level physiological processes, a degree of friction-reducing streamlining would be apparent in its overall morphology. And one could go further, and boldly proclaim that since this effect should logically apply anywhere, it forms the basis of the “Universal Law of Streamlining”, or words to that effect. But this kind of categorization would be misguided. For one thing, it places faith in the ‘logic’ of the initial premise without it having any explanatory power. And if the streamlining case was accepted, separate ‘laws’ might exist in parallel for other specific environments. All of these instances might indeed be universal, but all of them are subsumed by an encompassing and truly universal process, that of Darwinian evolution. Translating the streamlining example into an evolutionary outcome, we can see that individual organisms with even slightly reduced frictional drag need expend less energy to move at a given speed through their fluid medium, and are therefore at an advantage relative to their ‘normal’ fellows in terms of either getting food, or avoiding becoming food for something else. And this kind of survival advantage tends to also translate into a reproductive advantage, as a consequence of improved energetics and average longevity. The simple yet profound insights of natural selection thus supersede ‘streamlining’ or any analogous ‘laws of environmental shaping’. So then, can we refer to evolution as a fundamental and universal biological law? Certainly Darwinian evolution has been proposed as an essential component of any comprehensive definition of life. But from first principles, what might lead to us affirming the primacy of evolution, as in effect a universal biological law? To arise in the first place, any chemically-based life must proceed through stages of increasingly organized sophistication, which amount to a process of molecular evolution. It could be contended that the same processes that allow molecular evolution to occur in the first place do not and cannot simply stop at any particular stage of this progression, and that therefore, by its very origins, any biosystems must be inherently evolutionary. Any form of life must reproduce, and therefore any form of life must be viewable as an informational transmission system. Information, in some chemical form, must be copied and transmitted to each succeeding generations of organisms, of any conceivable description. A replicative system that is free from error in a formal and absolute sense is thermodynamically impossible, akin to a perpetual-motion machine. It is true that known cellular biosystems use sophisticated mechanisms for reducing replicative error rates and genomic damage (such as polymerase proof-reading and DNA repair processes), but there is a trade-off between energy investment in such systems and stability. Even the best of them still have a readily measurable mutational background. In any case, the essential point to note is that such error-correction is a highly developed mechanism which can only emerge long after far simpler biosystems have originated in the first place. Indeed, it is not the absence of error that bedevils models for the origin of life, but the opposite. Emerging informational replicative schemes must somehow deal with the specter of ‘error catastrophe’, which may seem to doom further molecular evolution before it gets off the ground. Reproductive errors provide the raw material for evolutionary processes, the stuff upon differential selection can operate and mold the formation of biological innovations and the acquisition of complexity. Natural selection is a simple process conceptually (albeit with many subtle implications) that occurs when variation occurs in competing reproductive units. It is logically compelling, and readily modeled with digital replicators in computer simulations and real-life laboratory experiments. Combined with a vast body of work ever since The Origin of Species by Darwin, the case for universality for both reproductive errors and selective forces defend the status of evolution as a universal bio-law. Yet, having made that point, one is immediately reminded of the role of mathematics in the physical sciences, as the solid underlying description of what a physical law actually specifies. Where is the mathematical insight in evolutionary theory? In fact, it has been noted more than once that the whole of The Origin of Species is an equation-free zone. Although the process of natural selection certainly has been mathematically modeled by others, an equation for natural selection cannot be used for specific predictive purposes, since the outcome of a selective process is entirely dependent on variable selective pressures, mutational rates, and constraints imposed by pre-existing biosystems and structures. On the other hand, it is quite possible to describe and represent natural selection as an algorithm of a special kind. Given the variables involved, the algorithm for natural selection is most accurately described as ‘incompressible’, in that no shorter operations can suffice to deliver the end result. In other words, the application of the ‘natural selection algorithm’ is already the shortest possible description of itself, and an outcome of evolutionary processes can only be determined by letting the algorithm run its course. No precise mathematical equations can enable calculations of such processes in nature purely from the outset. This conclusion argues that there is no directionality in evolution, and that chance environmental factors are necessarily significant. In turn, a logical corollary of non-directionality is that if the evolutionary ‘tape’ was replayed, it would be overwhelmingly likely that a different set of results would emerge. Yet this has been a controversial stance among certain evolutionary biologists, through several degrees of divergence. The most hard-core views of evolution as directional become essentially teleological, which presumes inherent evolutionary trajectories (usually) leading to the emergence of human intelligence. Such opinions, with or without overt suggestions of divine guidance (or at least a divine kick-off to the mysterious origins of life) are not in the mainstream. But it is certainly a legitimate stance to question whether evolution may be forced to take a particular pathway under specific circumstances, or at least to proceed via a limited number of possible routes. An important keyword in this field of investigation is ‘constraints’. And this is directly relevant to the theme of this post, since if certain constraints are all-encompassing, they might indeed qualify as biological laws of sorts, although (as extended a little further below), these are in effect sub-laws under the general umbrella of the higher law of evolutionary selection and change. Before moving onto that area, it should be noted that complexity ramping is possibly one ‘arrow of evolution’, where competition between increasingly complex biosystems continually and cumulatively progresses, and cannot be easily wound back without loss of fitness. But this is only a very broad generality, and far from the presumptions of directionality that have been made regarding higher-order outcomes such as human intelligence. In the present context, arguments against directionality of evolution can be side-stepped in any case, since an erroneous ‘directional evolution’ stance might be viewed as an even more overarching law than a non-directional process, and thus does not in itself dispute the ‘lawful’ status of evolution. Yet the power of evolutionary change is not related to any starting-point teleological influence. Is there anything else that might stand along side this law, as opposed to secondary laws that follow as a necessary consequence of evolution? The property of molecular self-organization is often cited as a fundamental requirement for the origin of life on Earth, and, by logical inference, for the origin of life anywhere. Some biological self-organizing systems may become (directly or indirectly) encoded agents of Darwinian selective processes (as considered further below). Yet for this to occur, the Darwinian replicative systems must have become established in the first place. Furthermore, self-organization in the form of molecular complementarities is a fundamentally important facet of genetic copying itself. There is accordingly a case to be made for self-organization / self-assembly as a fundamental requirement for any chemical life, and therefore attain the status of a Law. I suggest that a ‘Law of Alphabets’ can be also proposed, to the effect that autonomously replicating biosystems cannot originate and progress unless their molecular components are composed of subunits of a specific set of smaller compounds, termed ‘molecular alphabets’. Although Darwinian evolution is certainly applicable on a molecular scale, it needs a mechanism for replicative information transmission, which in turn is difficult to conceive without an ‘alphabetic’ system. Since it is argued that the establishment of such a system must be a primary event in the origin of life, alphabets should stand as another fundamental biological law. Moreover, at least some alphabets (as with nucleic acids) participate in self-assembly mediated by molecular complementarities, so the alphabetic and self-assembly ‘laws’ have regions of overlap. In any case, both the themes of self-organizational and alphabetic primacy will be developed further in a later post. But it is important to note once more that these three high-level laws do not translate into specific systems at lower levels, but only specify how such systems will develop in broad terms. Top level laws direct the formation of bottom level systems and processes, but only impose the broadest of limitations on what particular forms the bottom levels may take (the so-called secondary laws noted above). Expressed another way, by the definition of universality, the higher laws would be applicable to any extrasolar Life 2.0, 3.0 (and so on), but could say nothing about what molecular form these alternatives would take. Natural selection and evolution make use of diversity generation in replicative biosystems that are composed of various subunits. From first principles, if certain subunit combinations inherently possessed self-organizing or self-assembling properties, such a feature might afford a selective advantage for a biosystem possessing them over competitors which did not. It might in turn be inferred that selective forces will inevitably result in a gravitation towards biosystems harboring such self-organizing features. A number of investigators have championed the fundamental importance of self-organizing phenomena, particularly with respect to the origin of life, as noted above. Critics of this stance often suggest that too much emphasis is placed by such proponents on theoretical models, and not enough on real-world chemistry. But regardless of the details of origins, once replicative systems became established for biological information transmission, it can be argued that self-organization and self-assembly are properties of certain molecular entities that are themselves subject to evolutionary processes. Many examples of biological self-assembling systems can be cited, ranging from membrane components (synthesized by evolvable genomically-encoded enzymes) and directly encoded protein complexes. Insofar as self-organizing systems provide selective advantages, biosystems will be ‘taken there’ by selection itself. By this reasoning, some forms of self-organization are then tools of evolutionary selection, and should be distinguished from the more fundamental self-assembly processes (noted above) logically presumed necessary for abiogenesis and genetic replication. Although the abundant diversity of life on this planet is a testament to the power of Darwinian evolution to shape life, it requires no large leap of intuition to come to the conclusion that evolution is highly likely to have definite limits in terms of what can be achieved. Evolutionary constraints can exist at many levels, from the molecular to macroscopically morphological. An often-cited example of the latter is the absence of macroscopic wheels in any biological context, as opposed to a variety of other organs of locomotion. With respect to constraints in general, it is important to distinguish between processes or structures that are truly biologically impossible (which may be difficult to prove in practice) and those that are evolutionarily inaccessible. Since evolution cannot foresee a future benefit, all intermediate states (between a precursor form and a potentially superior successor arrangement) must themselves confer fitness benefits. If such improved intermediates are not possible, crossing a valley of lowered fitness in order to reach a higher peak on the other side may require a ‘single-step’ genetic jump of such improbability that it is essentially untenable. A biological macro-wheel, for example, is evolutionarily inaccessible for terrestrial mammals, but not formally proven to be biologically impossible per se. And more will also be said regarding the role of self-organization and molecular alphabets as potentially universal ‘laws of life’. Is Life Science governed by law? By fixed rules, by dictates, or more? Does life have a trend? Through patterns that show us the score? While confusing the search for a cause. ‘Why there should be this correspondence between mathematical constructs and reality…..’ A famous disquisition on “the unreasonable effectiveness of mathematics in the natural sciences” was published by the physicist and mathematician Eugene Wigner in 1960, available here. See also a very interesting paper on this subject by R. W. Hamming. ‘…the application of algorithms for deriving ‘free-form’ natural laws when experimental input data is provided….’ See Schmidt & Lipson 2009. ‘…..chance and necessity……’ A famous and influential book of the same title (in its English translation from the original French) was published in 1970 by the Nobel-prize winning biologist Jacques Monod. As an outcome realized within the physical universe, any biology must be underpinned by basic physical law; the deterministic question revolves around the extent that biological (evolutionary) outcomes are constrained by higher-level biological laws, and whether these are literally universal, or only local for a specific manifestation of biology. Although it is difficult to assert with surety, many biological results are likely to be highly contingent, where the higher-level ‘biological laws ‘ only serve to place very broad limits on the possible alternative outcomes. These trends are depicted schematically in the Figure below. Interplay between universal physical law and biosystem evolutionary outcomes. Each bar in the series is dependent on underlying laws represented by the preceding bar to the left. The dotted line within the Biosystems bar depicts a boundary between events where higher-order structure outcomes may be influenced by contingent factors as much as intrinsic laws molding any possible biology. ‘…..less restrictive definitions of biological laws have been acknowledged as having a certain practicality.’ For example, See Dhar & Giuliani 2010, who used the more relaxed law definition of “a frequently observed regularity that allows for a substantial improvement of our prediction ability in well-defined systems”. ‘……Hodgkin-Huxley mathematical model of neurotransmission……’ See their 1952 paper. ‘……the soliton model.’ See Andersen et al. 2009. ‘…..phenomenon of sleep might ultimately derive from some inherent property or intrinsic demands of neural networks. ‘ See Krueger et al. 2008. ‘………a wide range in both the quantity and qualitative nature of sleep periods required….’ For a discussion of the variation in mammalian sleep, see Siegel 2005. ‘……the Meyer-Overton rule provides a remarkable linear correlation between partitioning coefficients and minimal concentrations of antibiotics…..’ For more information on the history of the Meyer-Overton rule, see Heimberg & Jackson 2007. ‘…..anesthesia as a single phenomenon…..’ For background on this (as well as neurotransmission models), see Andersen et al. 2009. ‘…….the definition itself of a ‘gene’ has becoming correspondingly difficult…..’ See Pearson 2006; Pennisi 2007. ‘…….Darwinian evolution has been proposed an essential component of any comprehensive definition of life.’ This has been noted in many circumstances, including the so-called NASA definition, as discussed by Benner 2011. ‘A replicative system that is free from error in a formal and absolute sense is thermodynamically impossible….’ In this context is of interest to note that under some circumstances, certain organisms appear to have evolved strategies for actively increasing mutation rates in transient and targeted ways. For more background on such ‘adaptive mutation’ phenomena, see Roth et al. 2006; Galhardo et al. 2007. Note also that while mutations are an important source of the raw material for selection, genetic diversity can be generated in other ways, particularly by recombination processes. ‘……the specter of ‘error catastrophe’…..’ This concept was introduced by Manfred Eigen, a pioneer in theoretical early molecular evolution; see Eigen 1971. ‘….It is logically compelling, and readily modeled with digital replicators in computer simulations …….. ‘ For background on digital genetics and evolutionary simulations, see Adami 2012. With respect to laboratory studies on experimental evolution, see Elena & Lenski 2003; Kawecki et al. 2012. ‘…..the whole of The Origin of Species is an equation-free zone.’ / ‘ ……the process of natural selection certainly has been mathematically modeled…..’ See Schuster 2011. ‘…….it is quite possible to describe and represent natural selection as an algorithm……’ The status of the evolutionary process as algorithmically incompressible has been emphasized by Stuart Kauffman in his books, The Origins of Order and At Home in the Universe. See also Searching for Molecular Solutions, Chapter 2. However, here it is also noted that there is no formal proof that a shorter algorithm cannot exist. ‘……No precise mathematical equations can enable calculations of such [evolutionary] processes……’ The fact that the overall natural evolutionary process cannot be reduced to predictive mathematical formulas should not be confused with highly successful mathematical modeling for the effects of fitness advantages, kin selection, and so on. See Schuster 2011. ‘……the evolutionary ‘tape’ was replayed…..’ The late Stephen J. Gould was a noted proponent of the ‘diverging tape’ view, made eloquently in his book Wonderful Life. In an abstract representation of chemical systems, ‘replaying the tape’ was found to reproduce certain self-organizing phenomena, but nothing was specified beyond this most fundamental level (Fontana & Buss 1994). Theoretical arguments favoring inherent limits in evolutionary predictability have also been raised; see Day 2012. ‘……inherent evolutionary trajectories (usually) leading to the emergence of human intelligence. ‘ A noted proponent of teleology in an evolutionary context was the French Jesuit and paleontologist Pierre Teilhard de Chardin. Some of his opinions in this regard are presented in his 1959 book The Phenomenon of Man. ‘ A number of investigators have championed the fundamental importance of self-organizing phenomena……’ The above-noted Stuart Kauffman is also prominent in this regard, also described in The Origins of Order. ‘……too much emphasis is placed by such proponents on theoretical models…..’ For example, see a refutation by the late Leslie Orgel of models of self-organizing prebiotic metabolic cycles (Orgel 2008).